Find an affordable solution to promote both a stallion and a breeding operation. Something that's not breakable, useful and packs easily as the client travels from one show to the next. Can "Koozies". Light weight, made of foam rubber with the ability to imprint an actual photo of the stallion on front and back. Added benefit: it's a reusable item that will readily live in any horse-person's vehicle and/or trailer. Nothing worse than a hot drink at a horse show! Need a promotional item that stands out from the herd? Tired of the same old thing? Want more than basic pens and water bottles with plain designs? Do you really want your business or horse to stand out at the next show? Count on us for memorable promotional items that grab attention and brand your business! 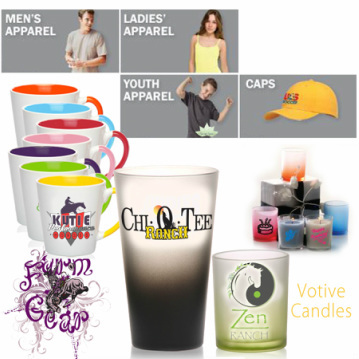 Most promotional companies offer a limited products with basic graphics or clip art. 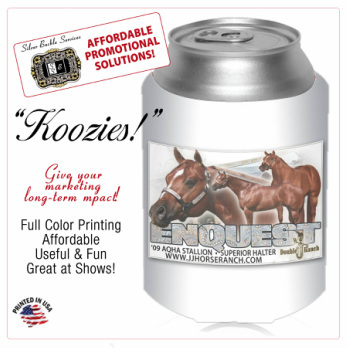 Silver Buckle Services works with a leading manufacturer of promotional products that will allow us to incorporate our unique Equestrian designs on a variety of affordable promotional pieces. Let us know what you're looking for, we'll be glad to put something together for you! Everything you need to show off your business or your horse! Custom signs and graphics that stand out and command attention! Why be satisfied with ordinary embroidered or appliqued logo's or art when you can use a photo drape. Our custom designs set your business apart from the competition! Whether you have one stall or several, simply want to add some "umph" to your current display we have several very affordable solutions to give you the attention you deserve.